Baker, G.R., A. MacIntosh-Murray, C. Porcellato, L. Dionne, K. Stelmacovich and K. Born. 2008. 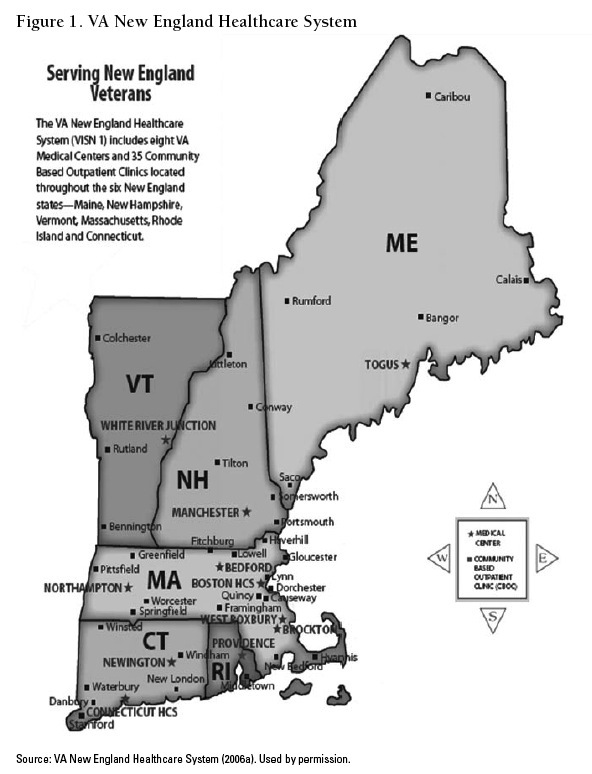 "Veterans Affairs New England Healthcare System (Veterans Integrated Service Network 1)." High Performing Healthcare Systems: Delivering Quality by Design. 71-114. Toronto: Longwoods Publishing. Twelve years ago the Veterans Health Administration (VHA) began the radical transformation process Jha et al. refer to above. What can we learn from the VHA's experience of becoming a high-performing healthcare system? How do the re-engineered processes and improvement efforts work at the regional and local levels? To answer these questions, in September 2007 a team of researchers from the University of Toronto's Department of Health Policy, Management and Evaluation visited the Veterans Affairs New England Healthcare System (VISN 1). These site visits were part of an initiative called Quality by Design, which aims to identify and define the elements of healthcare systems capable of improvement with a view to helping to inform strategic investments in improvement capability in Ontario. Quality by Design is funded primarily by the Ontario Ministry of Health and Long-Term Care in partnership with the Department of Health Policy, Management and Evaluation based at the University of Toronto. VISN 1 was one of five healthcare systems selected from a short list of high-performing systems nominated by a panel of international leaders and experts. The research team spent time at the VISN 1 headquarters in Bedford, Massachusetts (MA), as well as at two of the network's medical centres: the VA Boston Healthcare System (VA Boston) in West Roxbury, MA, and the VA Medical Center White River Junction (WRJ VAMC) in White River Junction, Vermont. At each site the team met with and interviewed administrative and clinical leaders, and improvement team leaders and members as well as support staff members working to make improvements. This case study highlights the findings of the site visits. The VHA's mission - "Honor America's veterans by providing exceptional health care that improves their health and well-being" - encompasses patient care, education of health services providers, research and support for disaster response (US Department of Veterans Affairs 2007b). This is a special patient population that evokes strong values when staff members describe their work; these people regard caring for veterans as a noble mission (VA Medical Center White River Junction 2007). As VISN 1's chief medical officer observed, "Vets are wonderful patients, very patient with teaching and the residents." Staff members' positive regard appears to be reciprocated. Patient surveys reflect high satisfaction levels with the overall quality of care: in a 2006 survey, 83.6% of out-patients and 81.1% of in-patients rated overall quality as "very good" or "excellent" (VA New England Healthcare System 2006a). The veterans present a challenging set of needs and circumstances. "We really do take care of the poor," said VISN 1's network director. Veterans' average salary is lower than that of civilians outside the VA and the military. Between 35% and 40% of the homeless in the US are veterans; consequently, the VA healthcare system often acts as a social safety net for these people (Kizer et al. 2000). How this safety net is funded and what kinds of care are covered are somewhat complicated issues and have varied over the years. The Veterans Equitable Reimbursement Allocation (VERA) system distributes care funding to VISNs for different categories of patients. As a priority, all service- and combat-connected conditions are covered, as is the care of other enrolled veterans. If a veteran has private insurance, the VHA can bill the insurer (but not Medicare/Medicaid) for care provided for conditions not related to military service. In the past, not all potential billings were collected; centres have therefore implemented initiatives to streamline their billing processes to increase third-party billing revenue. A proportion of the veteran population chooses to seek medical care outside the VHA. These people may, however, still take advantage of the system's drug benefits. VISNs are accountable for tracking the care and outcomes of such "co-managed patients." As a result, VA physicians are responsible for getting information about such care, data that are then entered into the VHA's electronic health records. VISNs were established in the mid 1990s by then-Under Secretary Kenneth Kizer, architect of the VHA's massive re-engineering (Kizer 1995, 1996). The VHA has undergone "a profound change" from being a hospital care system to becoming a health care system (VISN 1 chief medical officer). In other words, the VHA transformed from a very acute care-centric model dominated by individual hospitals to an integrated regional system that emphasizes primary care in the community. Since 2000, Dr. Jeannette Chirico-Post has been VISN 1's network director (prior to that, she was its acting medical director and acting network director). Chirico-Post has been with the VA for 32 years. In the 1980s she ran VA Boston's quality program and was a member of an early VHA performance improvement committee under Kizer. Chirico-Post reflected on Kizer's style and, with a smile, recalled his "I'll give you the tools, now go away and do it" approach. The Kizer principles fit with Chirico-Post's own philosophy, for example, an emphasis on care in the community. Chirico-Post therefore started working from day one on primary care, because it offered "the biggest bang for our buck" due to duplications and gaps in care processes. Consistent with Kizer principles emphasizing national regulations, standards and practice guidelines, VISN 1 has adopted standardization and systematization as its watchwords. Teams in the medical centres working on clinic access and patient flow processes have made strides in reducing wait times and missed appointments (see later section on the VA Boston initiatives and graphs in Appendix A). From her systems view of the network, Chirico-Post described local examples of patient access and flow problems, as well as equipment and process issues that VISN 1 continues to address - including, for example, the distances that some veterans must travel for radiation therapy. The network structure presented opportunities to streamline and rationalize supports, including equipment, throughout all levels of care. Standardization also continues to provide several benefits; for instance, it promotes safety and saves resources. With standardized infusion pumps and defibrillators, for example, VISN 1 has to offer only one training course instead of multiple courses tailored to specific models. It is also easier and safer for staff members to move around within the system when they are familiar with the equipment. This flexibility is particularly important because the VISNs' mission also includes disaster response support in the event of local and national emergencies. 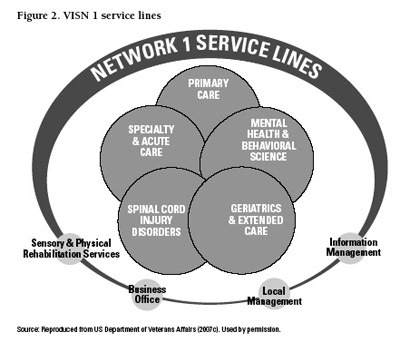 Four support service lines include sensory and rehabilitation care, information management, business office and local management at the eight medical centers (Figure 2). Patients are assigned to primary care teams that coordinate their preventive care, disease management and referrals within the continuum of care, as required (VA New England Healthcare System 2007). Within each service line, local service line managers report both to their chiefs of staff and facility directors, as well as to a network-level service line director. In-patient nurses report to facility nursing directors, while out-patient and community nurses report through their service line managers, individuals who are also responsible for day-to-day operations. Credentialing and certification of clinical competencies fall under the central nursing structure. A variety of meetings are held to facilitate communication within and between service lines. Each service line has its own executive committee and regular meetings. Service line directors, nurse executives and chiefs of staff for all eight medical centres meet monthly as the Clinical Leadership Committee (see network committee structure in Figure 3). This gives them a chance to hear presentations (e.g., about improvement initiatives) and to "rub shoulders," as VISN 1's chief medical officer explained. 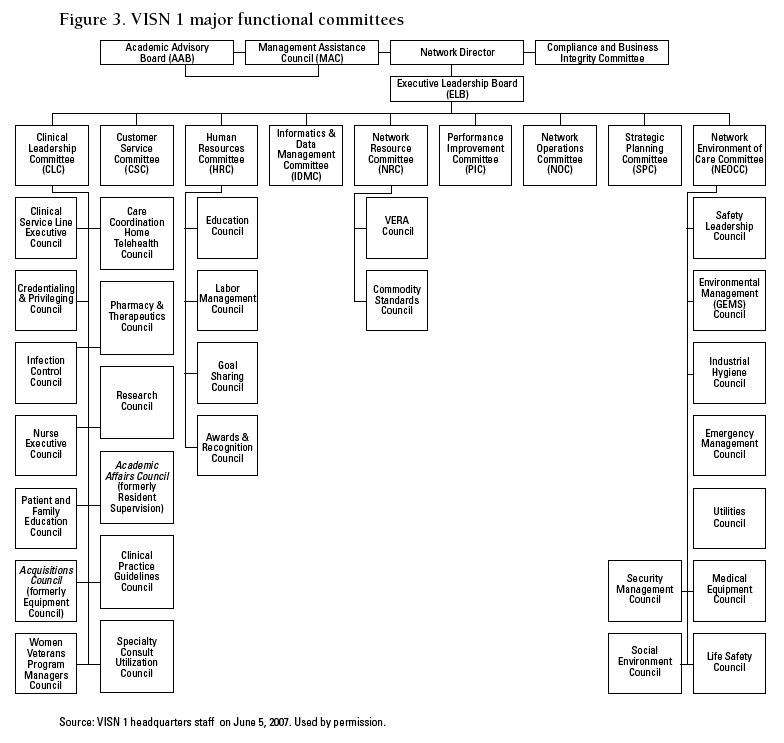 Although creation of the VISNs decentralized decision-making from the national level to regional networks, VISNs also had the effect of centralizing budgets and integrating planning within the network structure. Network leaders commented that the restructuring has not always been easy and it has taken a while to develop the VISN 1 organization with roles and responsibilities matched to current needs. VISN 1's leaders undertook a year-long self-examination and realigned roles, responsibilities and power distribution in order to address more effectively the network's operating environment. When he established the VISNs, Kizer also introduced stronger accountability, with an emphasis on standardizing and quantifying performance. "What Ken did for us was to ensure that from Caribou to California we were doing the same thing," observed Chirico-Post. Kizer believed in stretch goals and setting targets for all to meet. Detailed performance contracts with agreed-upon goals and standardized measures were implemented first between VHA headquarters and the network directors and program officials. Now, there are similar contracts throughout all levels, right down to local service line managers within the facilities. Each network monitors a basic set of measures for the same elements of quality, cost and access: "We know from June '07 what the basic contract for '08 will look like" (Chirico-Post). When they began in the 1990s, they worked with 20 measures. "Now we are tracking hundreds" (Chirico-Post). The number of measures used reflects evolving views in the VHA about organizational priorities and the range of issues that can reasonably be managed. VISN 1's quality management officer (QMO) is responsible for preparing and disseminating performance measurement data through the system. Each of the network's medical centres has a quality manager, most of whom have a nursing background. All quality managers at the centres and the network QMO have monthly conference calls and they meet face to face on a quarterly basis. VISN 1's QMO also works with a network performance improvement committee that was formed in order to track and analyze performance data more effectively and to make recommendations for actions that support the senior leadership team. As an example of its work, the performance improvement committee redesigned VISN 1's scorecard under the leadership of one of the network's service line directors. The quarterly reports include an array of in-patient and out-patient clinical, process and satisfaction measures (see Appendix B). Approximately one third of these measures relates to wait times and missed appointments, indicators that are linked to national access goals. 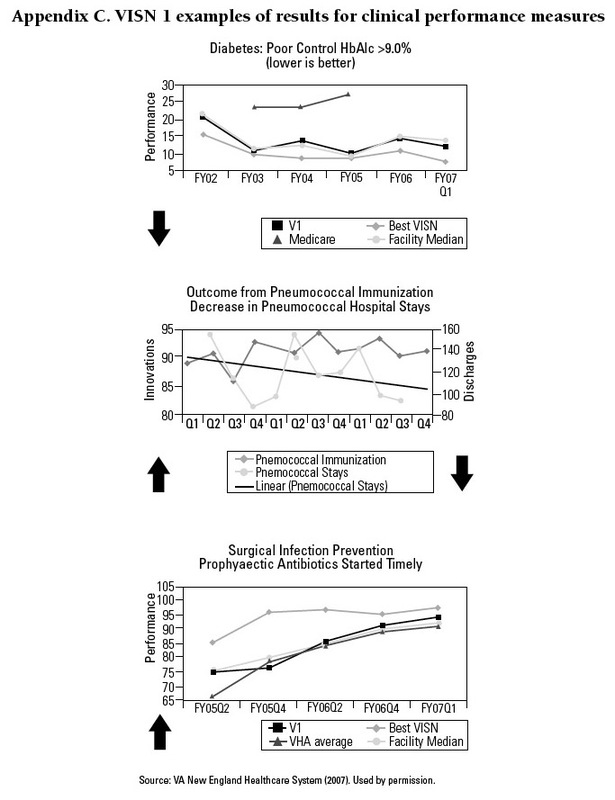 Indicators are derived from data collected from chart audits carried out by the VHA External Peer Review Program (EPRP) (US Department of Veterans Affairs 2001) (see Figure 4). Through the national EPRP, third-party reviewers audit a monthly sample of electronic and paper records in all VA medical centres. These reviewers scrutinize preventive indicators and clinical practice guideline compliance, such as HbA1c control in diabetes management or timing of prophylactic antibiotic administration in surgery (see examples of results in Appendix C). VISN 1 has a full-time analyst who prepares the reports (not all networks have invested in such a support position). In addition to the VISN scorecard, each service line has standardized monthly reports that focus on a "vital few measures" relating to quality, revenue and cost. They also include a description of what the service line is doing to add value to the service line and for its affiliates. The power of the service line structure, VISN 1's chief medical officer said, "is that it allows clinical disciplines to be focused and develop metrics of excellence specific to the service line." The performance measurement system figures dominantly in any conversation about quality and improvement in VISN 1. Discussion invariably circles back to performance review of the measures and targets on the quarterly comparative scorecard, the "Christmas tree report," a nickname derived from the gold, green and red flags for scores that exceed, meet or fail to meet targets. 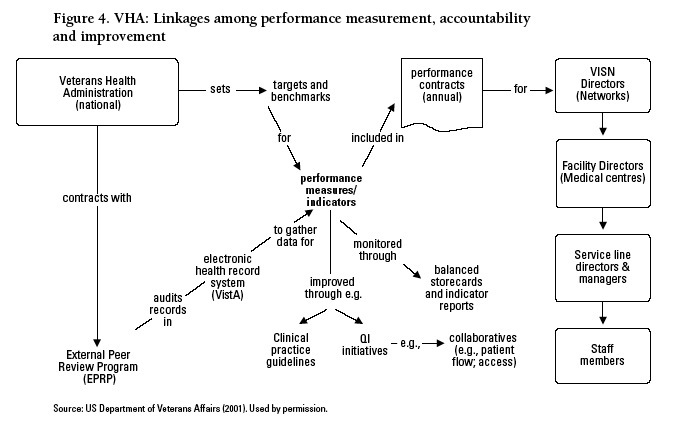 The VHA's national office sets performance targets for all the performance measures. In addition, it establishes a "floor." If any facility does not meet the "floor" target, the network fails the measures. VISN 1's director and QMO meet quarterly with facility directors to go over their Christmas tree reports. The QMO emphasizes improvement over compliance in discussions of action plans. He finds out from high-performers what they are doing well and generates a lessons-learned list that he circulates across the network. "My concern," he reported, "is improving. How do we get to the next level of performance?" The VISN 1 service lines also conduct quarterly reviews with the intent of discussing and capturing improvement opportunities arising from the reports. The QMO noted that "the point is that any measurement system needs to focus on meeting the target as a marker of good clinical care. It should be about the care, not about the numbers." VISN 1's service line directors use the quarterly reports to review the performance of all local service line managers. Outstanding performance is defined as being better than the national and the VISN average. A facility director can overrule the performance review decisions of the service line directors; however, that rarely happens. One service line director noted, "You have to make the metric. ... The metric part of the job is not negotiable." Service line directors hold monthly meetings with managers and telephone conversations with each one individually. Near the end of 2007, one service line director explained that he was focusing on measures that were close to the target (one percentage point away) because he could "push those over the edge." He said he had deferred working on tobacco counselling, for example, because he could not influence the more than 20% gain that would be required by year-end. However, he was working on the system issues behind that measure, discussing with managers what was going on and how to fix the process during the upcoming reporting year. About 60% of the indicators are new each year and/or targets are changed. Some measures count for the whole year and some relate only to a specific quarter, such as immunization rates in the winter quarter. The VHA is a recognized leader in the implementation of information technology that has enabled both indicator measurement systems and coordinated patient care management. Nationally, the VHA's clinical patient record system (VistA) won the 2006 Innovations in American Government Award presented by the Ash Institute in Harvard University's Kennedy School of Government (US Department of Veterans Affairs 2006e, 2006f). Setting the same standards and using electronic health records have been central to integration throughout the VISNs. In VISN 1, for example, early in her tenure Chirico-Post recognized the importance of standardizing information technology across the network. As a result, between $25 million and $30 million were set aside for new computers, which enabled the move to electronic health record-keeping. There was some initial resistance to mandatory electronic charting; however, VISN 1 staff members did make the switch, although dictation of operative notes and discharge notes is still allowed. The VHA's electronic record system made possible the implementation of clinical practice guidelines (CPGs) and clinical reminders, which are mandated for primary care by the CPG committee and reminders subcommittee. The same requirement was then applied to mental health and specialty and acute care (e.g., for acute myocardial infarctions). The VHA's Office of Quality and Performance develops clinical practice guidelines for the system (US Department of Veterans Affairs 2006d, 2007d; see Appendix D for a description of their functions). In VISN 1, the goals are to standardize reminders across the eight sites and to reduce reminder overload. A service line sponsor and subject matter expert is assigned for each reminder that is developed. The system can produce reminder reports by provider within each facility and make comparisons across centres. The reminders and positive feedback help to improve clinical care. They also encourage a bit of "healthy competition," the program manager noted, because no one wants to be seen as not responding to reminders. The reminder system is so well advanced that the VISN has reached a saturation point, prompting the need to explore new approaches to continue to improve compliance with guidelines. For example, the VISN is considering use of support staff rather than physicians to carry out preventive care with patients, such as checking immunization status. The reminder program has been very successful: since the inception of the program in 2004, VISN 1 has been first or second in the VHA primary care performance measures. The use of electronic medical records is an important factor facilitating physician accountability. "Our ability to do performance measurement, monitoring, physician accountability [and] workload measurement is all grounded in the electronic medical record. How you would do this without it, I don't know," commented one service line director. "If it's not all integrated it loses a lot of its power. ... The clinical information system can produce information that the decision support system can't." The VHA has developed a standardized staffing model for all primary care clinics. A VHA advisory group on physician productivity and staffing (chaired by VISN 1's chief medical officer) developed strict business model guidelines for and definitions of what constitutes a patient panel, and used a combination of number of exam rooms, number and types of support staff and patient mix to determine expected or model panel sizes. It is now possible to carry out sophisticated studies of the relationships between panel size, quality, access and patient satisfaction. This innovation also helps to reduce variation. Most VISN 1 physicians are salaried employees, although some are on contract and may be paid on a fee-for-service basis, especially in scarce specialties such as neurosurgery, obstetrics and gynaecology. An element of pay-for-performance is included in the physician reimbursement plan if a physician meets performance targets, such as quality measures or access. The incorporation of pay-for-performance is seen as only part of the solution to improved performance. Chirico-Post summed up VISN 1's improved performance thus: "My legacy: when we started we met one third of the performance measures. Now we are in the top tier of percentage met." VISN 1's leaders emphasized the importance of articulating clear goals. Early on, the senior leadership team set a goal of clinical and research excellence, wanting to be number one. "We wanted to be the leading academic network in the country, measured by the number and value of research grants," the chief medical officer noted. "We are a leading academic program in spinal cord injury and we are a leader in mental health." This position helps with staff recruitment because it draws top investigators and clinicians to the network. While VISN 1 has demonstrated significant gains, there are tensions inherent in how integration, standardization and performance measurement have unfolded within the system. VISN medical centres are by no means homogeneous; neither are their approaches to improvement. Individual centres have had their own struggles with how to implement the nationally mandated performance measures and standards. The experiences of VA Boston and WRJ VAMC illustrate these challenges. As part of a large, complex, hierarchical system, their facilities' leaders have found ways of adapting the system's requirements to fit with strategies they believe are needed to meet local population needs. With characteristic good humour, WRJ VAMC Director Gary De Gasta summarized the challenge: "How do we do what we need to do in the context of a national organization where we do share the same goals, but where we sometimes need to do something a bit different - and not get into trouble!" VA Boston, the largest consolidated facility in VISN 1, encompasses three main campuses and six out-patient clinics within a 40-mile radius of the greater Boston area. The consolidated facility consists of the Jamaica Plain Campus, the West Roxbury Campus and the Brockton Campus (US Department of Veterans Affairs 2007e). VA Boston grew out of the integration of two large centres in 2000: Jamaica Plain and West Roxbury/Brockton (the latter the result of an earlier merger in 1983). "At integration it was really hard; we started from zero because we didn't have common quality programs," commented the associate director of nursing. "We needed to rethink two very different sets of organizations, processes and cultures," said the quality manager. VA Boston's current approach to improvement incorporates the VHA and VISN performance measurement system. It also includes formal change initiatives, such as participation in collaboratives run by the Institute for Healthcare Improvement (IHI). VA Boston is responsible for the same basic mix of population health measures as other VISN 1 facilities, including immunization rates and percentage of patients who smoke, as well as clinical process, access and patient satisfaction measures. Director Michael Lawson asserted, "You need some mandatory measures and to hold people accountable for them." But use of the measures and other means to stimulate performance have changed over time, as the organization has come to understand better what motivates its employees. For example, VA Boston leaders debated the merits of financial rewards for compliance with the required measures. The chief of staff argued that reimbursement mechanisms can be a powerful incentive. In the last year, the centre introduced an element of pay-for-performance for physicians, a $1,500 bonus for meeting some percentage targets. Director Lawson did not see money as the only motivator: "If the only leverage you have is money, you are in a very difficult situation. ... Culture is important - pride in doing things well." The chief of staff concurred, "It is the performance measures and the information and feedback to people in the right culture, where people care." He continued, "The Hawthorne effect is very important; when you measure something, people pay attention." However, the performance measure review at the local level can, one senior leader noted, generate "pressure and competitiveness; no one wants to be on the lowest rung." Lawson said, meanwhile, "We know who is number one and where we are; we are very competitive and we want to do better and be the best." With regard to the development of the measures themselves, the chief of staff commented that most staff members understand intuitively the literature and evidence behind the measures. Some disagreements do arise: for example, the monotherapy guideline for hypertension was not perceived to be correct (some patients and physicians were reluctant to add a medication if a patient's blood pressure was stable) and an antibiotic guideline for patients presenting with pneumonia was not seen to be working; as a result, these guidelines will be reviewed. Evidence-based reviews and the flexibility to re-examine performance measures over time are important factors that have encouraged acceptance of performance measures. Centrally developed evidence-based directives must be locally adapted for implementation. "It is 10 years into performance measurement and we are still getting to agreement," summed up one senior leader. VISN 1's QMO noted that "the overarching issue is for the organization to achieve balance between the art and science of medicine; some measures ... will ... have more evidence than others and some patients' conditions are complex enough to not fully match a given guideline. Also, there are technicalities with how measures are defined, gathered, etc., so that a couple to a few each year get pulled or modified to work out details." The measures continue to evolve, expanding to include development of nursing-specific indicators. VA Boston is a pilot site for the VA Nursing Outcomes database. The system will, for example, soon provide national comparative data on decubitus ulcers, medication issues and falls. Currently, unit managers have a quarterly report card with these measures reported by unit, which they review with their staff members (see Appendix E). The nursing measures are reported to VA Boston's quality manager as part of its quality improvement (QI) plan. Adaptation, monitoring and review of the measures are preliminary steps in the performance measurement system; changes must be implemented to achieve improvement. VA Boston leaders invest to make changes when services or clinics demonstrate need based on the measures. For example, the dermatology clinic management staff and clinical leaders maximized process improvements to reduce wait times, which allowed for a more accurate supply and demand analysis that demonstrated the need for more staff members (who were subsequently hired). VA Boston follows systematic processes to implement changes and make improvements. Teams apply an evidence-based approach, noted the associate director of nursing: "We make changes based on what is in the research literature." According to the quality manager, "The big change in approach that allowed improvement in the performance measures was assigning teams and supporting them, and the encouragement." The VA Boston system pays a lot of attention to how teams and committees operate in order to promote efficient and productive meetings that make good use of staff time and enthusiasm. The need for staff involvement is discussed with managers in advance to ensure their understanding and support for staff participants before projects are launched. Four different nursing unions represent VA Boston staff, a situation that can present challenges for improvement efforts. Earlier, unions required that changes to work processes that were perceived to affect job responsibilities be negotiated in advance before the changes were even tested; however, this has become less of an issue over time. "We are very thoughtful about who we select for physician leaders and participants, and we are also very clear about endpoints and expectations. We are very clear about who we want, why we want them and what we want them to do," the quality manager commented. Most physicians are employees and are part of the system, which sometimes makes a difference in physician engagement, but the issue is not payment structures alone. "Some of my most enthusiastic members are fee-for-service [physicians] ... who see where the improvements can be made." Project team processes are designed to respect staff members' time and to use their talents; this design encourages participation. The chief of staff (or associate) and the quality manager meet once a year with each committee chair to find out how things are going, whether there are any issues and how they can support the committees' work. Lawson advised, "Pick demonstration projects and start where there is some promise." He cautioned that implementing best practices may be problematic, as changes have to be tailored locally. "What works in Boston may not have a chance in Maine." VA Boston's formal change efforts include multi-centre collaborative improvement projects. The centre has a long history of participating in IHI Breakthrough Series collaboratives. VA Boston teams have participated in the access collaboratives since 1999 and have engaged in several each year for the past five years, including collaboratives on flow, patient medication safety and transforming bedside care. The influence of the IHI methods and the rapid cycle model for improvement are pervasive in the centre, which emphasizes interdisciplinary teams and action plans. "It's always 'What are you going to do by next Tuesday?' (an improvement mantra derived from a talk by Don Berwick). Rapid cycle methodology made so much sense and was intuitively appealing to the front-line staff and teams," the quality manager said. All management team members (i.e., service chiefs and senior leaders) have been trained in rapid cycle methods, change concepts and improvement strategies. Team members are taught how to map their current processes and the concepts of value stream mapping. They use rapid cycle improvement methods, planning and testing change cycles. The goal is to have the actual teams do the work; they therefore emphasize short meetings or 15-minute huddles and do as much as possible by e-mail. Although many network facilities participate in IHI collaboratives, the extent of VA Boston's involvement in IHI initiatives is somewhat unusual within VISN 1. This is a strategic investment and significant commitment due to the cost of IHI collaboratives, which average $20,000 a year plus travel per team. As the quality manager commented, "We always take our whole team to the collaborative meetings, plus the leadership sponsor; it signals the importance [of the initiatives]." In 1999 the VHA began a major national initiative with the IHI to improve patients' access to out-patient clinics by reducing wait times for appointments (Institute for Healthcare Improvement nd; Parlier 2003). "It took about a year before we saw dramatic results locally. ... Within two years we were at the top of our VISN and within three years we were in the top three nationally. ... At the start our actual [performance] was 60 to 90 days, and our current is 14 days and we are working towards open access," recollected the out-patient access coordinator. The VA Boston access coordinator is the medical centre's local point of contact with the national advanced clinic access (ACA) initiative. She works alongside physician champions with the centre's ACA steering committee and participates in VISN-wide meetings. Their work with specialist clinics has been a success. In the access coordinator's words, "Even in orientation, new medical staff are told what the expectations [on access] are, and that delays are not acceptable." The access team identified an initial list of about 10 high-volume, high-priority clinics, such as primary care, cardiology, audiology, surgical, mental health and orthopaedics. Based on that experience, the team is now expanding the initiative to the top 50 clinics. A clinical champion and an expert in advanced clinic access were identified for each clinic, and the committee set an access goal that patients will have an appointment to be seen within 30 days. By focusing on what can be done, staff members become more engaged in accomplishing goals. If staff members say, "'No, we can't do that,' we ask, 'Okay, what can you do?'" said the access coordinator. The team also pairs similar clinics so they can learn from the experience of the ones who have been successful. "The whole VHA system is open to sharing accomplishments and tools," and because they share components of the information systems teams "do not have to start from scratch." VA Boston's access collaborative teams follow the IHI Breakthrough Series model, especially its data requirements, although the data and information commitment can be very demanding. Over time, local data systems have become more flexible, reducing the need for "stubby pencil" work. "It can be hard to get the team members to stop and gather the data and measure and huddle, but once they see results it helps," noted the access coordinator. Across the 21 VISNs there have been national-, network- and local-level collaboratives on access. By meeting together on a network-wide basis, audiologists, for example, were able to share ideas for changing the design of their audiology clinic processes. VA Boston is one of the most successful participants in the IHI Breakthrough Series flow collaborative. As the largest acute care centre for VISN 1, VA Boston was under pressure to improve patient flow; the centre therefore joined the IHI initiative in 2002. Currently, VA Boston has flow teams working on in-patient, operating room, emergency department (ED) and long-term care flow issues. The West Roxbury units achieved these results by developing standardized order sets and implementing a fast-track system to handle less complicated patients. Initially, not all the changes were readily accepted: "Redesign was vigorously resisted where it was seen to interfere with clinical autonomy," noted the ED medical director. The ED information system provides the data needed to monitor productivity; West Roxbury's leaders were therefore able to show staff that changes were leading to improvement. As the nurse manager commented, "Data speaks volumes" and was sufficient to persuade most staff members. Even at that, some among the medical staff did not immediately recognize the benefit of seeing the fast-track patients, preferring not to interrupt their focus on the more acute patients. The ED flow team moved the fast-track room to the front of the computer terminals as a way to heighten awareness of the fast-track patients and their needs. In addition, staff members call the few patients who leave without being seen the next morning; patients are pleased and surprised by this attention. The ED leaders commented that the flow team has made a real difference in ED culture. ED staff members brainstorm ideas, develop implementation plans and try them out the next day. Everyone involved has a say and all staff members vote on priorities, based on the ideas that are within their control to implement and that are a priority for their patients. The in-patient flow coordinator and the out-patient access coordinator are looking at forming a joint steering committee to focus on the linkage and coordination of in-patient and out-patient flow and access issues and changes. This will create a more comprehensive system redesign committee. VA Boston has been involved in a variety of patient safety initiatives for some time. "We have been ahead of the curve because we started in advance voluntarily, before we were required to," noted the Patient Safety Committee chair, a cardiovascular surgeon. Boston was a pilot site for medical team training and briefings designed by the National Center for Patient Safety, as well as IHI's perioperative safety program. The Patient Safety Committee also oversees the implementation of the IHI 100k Lives initiatives, which have presented a variety of challenges. "None of this was easy," observed a cardiologist member of the team. The physician leaders emphasize the importance of letting everyone discuss proposed changes, noting "eventually you have to move on and implement." The Patient Safety Committee chair recounted the example of glucose control for surgery patients, saying it took a year to implement a modified Portland protocol. "You can't eliminate individual variation and make everyone follow one protocol." Data on the Portland outcomes were stressed as important. All involved staff members were part of the change process, and some variation was allowed in how they got there. Now glucose levels are controlled for 94% of in-patients. Participants emphasized that, at times, the improvement work could be very challenging and taxing for everyone involved. "The changes were not all smooth. There were a lot of blood, sweat, and tears," laughed the patient safety coordinator. "But now people say 'may as well do it because it will be required in a few years.' That's a real change." VA Boston is affiliated with both Boston and Harvard universities' medical schools and 500 to 600 residents per year complete six-week clinical rotations at the centre's facilities. In 2006 VA Boston's General Internal Medicine program started a new patient safety and QI rotation as an optional elective open to approximately 12 third-year residents per year. The hospitalist who designed the program with the patient safety coordinator commented that physicians tend to be trained in individual decision-making as opposed to systems thinking, noting that, "It's not fair to expect people to be involved in quality and patient safety if we don't train them in it." The one-month rotation integrates patient safety and QI education with clinical time in subspecialty clinics. Residents review charts of in-patients for whom they have cared prior to starting the elective, tracking their post-discharge care to look for any iatrogenic complications and care issues as well as changes they could make to their own practices. As an example, the in-patient discharge record was changed to record impending issues. Residents participate in root cause analysis (RCA) reviews and patient safety meetings and also learn about the Joint Commission national patient safety goals and healthcare failure modes and effects analysis. According to the quality manager, "We spend a lot of time and effort working on staff satisfaction. ... We have very high staff and patient satisfaction. VA Boston was second in the All Employee Survey results for VISN 1, "which is huge, because we were at the bottom seven years ago. In nursing, we are one of the best in the nation," observed the associate director nursing/patient services. There is a strong emphasis on customer service at VA Boston, spearheaded by the efforts of the Customer Service Committee, formed in 2004 based on needs staff members identified during annual priority planning. The committee has worked on a variety of issues, ranging from improving signage and directions for patients and visitors to arranging for beepers for patients with prolonged care or clinic delays. Committee members review patient satisfaction survey results and patient complaints, and canvas staff for suggestions. There is also an ambassadorship program in which patients are met and greeted in waiting areas. In the past three years, all VA Boston employees have been required to go through customer service training based on a standard program provided by the VISN. In recognition of these efforts, the centre won the 2007 VHA Comprehensive Facility Customer Service Program Award. The WRJ VAMC is a rural, 60-bed primary and secondary care medical centre affiliated with the medical schools at Dartmouth College and the University of Vermont (US Department of Veterans Affairs 2007f). Under Gary De Gasta's leadership it has forged a strategy-driven path to improvement developed over almost 20 years. In 1994, in a move that predated the VHA's re-engineering initiatives, De Gasta invited Dr. Paul Batalden to help the senior leadership team develop a strategic framework to guide the organization. Batalden is an internationally respected expert in improvement who leads the Health Care Improvement Leadership Development group in the Dartmouth Medical School's Institute for Health Policy and Clinical Practice (formerly Center for the Evaluative Clinical Sciences [CECS]) (Dartmouth College 2002a). Monthly working sessions took place for over two years, building insights that resulted in a profound understanding of White River Junction as a system capable of improvement (Batalden and Mohr 1997; VA Medical Center White River Junction 2007). Batalden insisted that each of the facility's leaders had to take ownership of and personally lead one of the four strategic themes that were identified. Despite initial resistance, WRJ VAMC's senior leadership team took on that task, demonstrating strong constancy of purpose over the years in the face of continuous changes in their environment. "It has created a frame to allow the conversation about quality to happen, and Gary has sustained the focus and the interest in that," Batalden noted. In 2007, WRJ VAMC completed its 11th and 12th cycles of Carey and Baldrige applications. "I think it gives us a structure in an environment in a constant state of flux. We have no consistency, so this is the one consistency," remarked De Gasta. "It all fits: the six process chapters and the one results chapter. ... Baldrige involvement has been a big contributor to our financial solvency," he added. However, De Gasta explained, there is a cost to the work involved and the resulting feedback process: "It is so painful to get the feedback report that we ask ourselves every year should we do this. But the opportunities for improvement [identified by the examiners] are rarely a surprise. Two thirds are things we knew about and one third are things we failed to communicate well enough." Adopting the one approach started with Batalden and now continued with Baldrige has been important. ... Over the years we have continued to grow this one process, this pathway. ... During turbulent times we didn't change our process, we stayed with it. We've tried lots of new things, but we put it in that same framework. You start to see that there are places for the entire organization in the Baldrige criteria; by the time you get to chapter seven, you see how it all contributes to quality. ... We've learned that you don't implement a change today and see results tomorrow; it's been a long process for us, over 10 years. The "turbulent times" referred to by several staff members included a period from 1997 to 1999, when the quality of WRJ VAMC's surgical services was called into question. While an external review showed that the quality was good, the next challenge asserted that it would be less expensive to contract out the services (another external consultant study showed that this was not the case). These challenges were traumatic for the centre and provoked an exodus of medical staff members, from which it took several years to recover. It is relatively more difficult for an entire network (than a single facility) to be successful in these award review processes. VISN 1 has also adopted the Baldrige framework and uses the principles as the model for its governance committees (VA New England Healthcare System 2006a). The network won a VHA Kizer Quality Achievement Recognition Grant in 2004-2005 and used the award money to fund improvement initiatives in the network facilities (US Department of Veterans Affairs 2006b). Medical centres and community-based out-patient clinics submitted project applications to VISN 1 headquarters, and Dr. Chirico-Post decided to fund all 31 projects by supplementing the Kizer award funds. Although VISN 1 submitted another application in 2007, the network did not advance to be considered for the Carey awards. WRJ VAMC leaders have had to translate the VHA performance measures to fit the Baldrige/Carey framework. The centre balances the expectations and structure of the national/VISN performance measures against its own organizational strategic theme-driven measures and reports. WRJ VAMC has been obliged to manage the national performance measurement system to some degree, while managing by its own report card process. "Performance improvement really came into play when Ken Kizer said, 'No, show us how you are doing.' ... His efforts really changed the face of the VA," noted De Gasta. "'BK' (before Kizer) we had no measures; we said we were good but we didn't really know. 'AK' (after Kizer), we have lots of measures, but we are still not there yet." De Gasta observed that WRJ VAMC had developed its own performance measures and "stoplight report" before the VA "kicked up the performance measures and we got a lot more." Now it is responsible for hundreds of measures, an obligation that some leaders find difficult to manage. WRJ VAMC therefore developed a strategic themes stoplight report to focus on the important clinical, financial and satisfaction measures (Figure 5). For example, the centre's quality manager noted that on the VISN Christmas tree report there are no employee-related measures, which WRJ VAMC leaders felt were critical. 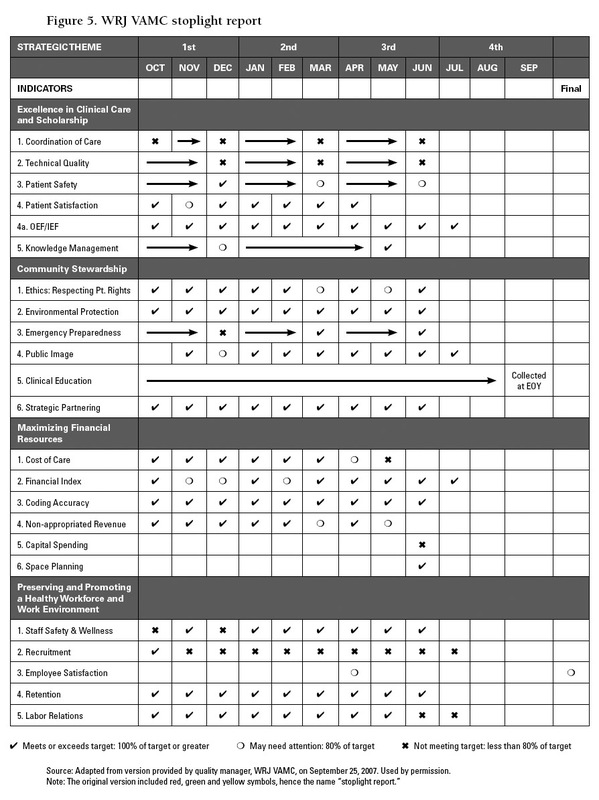 Spurred on by the Baldrige criteria, they added position vacancy and injury rates as measures. Likewise, neither the Christmas tree nor the national performance reports contain measures of ethical performance or community image; therefore, the quality manager said, "we took on more measures over and above those required of us." WRJ VAMC decides which of the 20 to 30 measures in each category are important in relation to the strategic themes. (Each theme includes five or six sub-themes, and some sub-themes are a combination of multiple measures.) The governing board's executive committee then decides which measures are the most critical. "Each year we tweak the list of measures at our annual retreat," reported the quality manager. The goal for WRJ VAMC leaders is to complement the national measure set and align it with local priorities. Several years ago WRJ VAMC was at the bottom of the VISN Christmas tree report, which required that centres meet at least 80% of all VISN measures. WRJ VAMC executives began a First Friday meeting to discuss with all process owners how the organization was doing and what could be done to improve. Staff members attend these meetings with Plan-Do-Check-Act (PDCA)-type action plans and give progress updates. The chief of staff commented on the collaborative nature of the discussions, noting that "The interdisciplinary discussion of the measures across service lines is valuable." For example, the director supported a system change idea (appointing a new case manager) to help the centre meet multiple performance measure requirements for in-patients, such as smoking cessation counselling and primary care prevention. Measures are also discussed with front-line staff members at staff meetings. "We were pretty well prepared when the focus on measurement came down from the VA," the WRJ VAMC chief of staff remarked. "The philosophy of support from leadership has been key." He recounted how he had "put a team together for every single measure we were responsible for, whether we were doing well or not. I didn't trust the data, so I thought it was safer to work on everything to improve." WRJ VAMC has a mix of more formal project teams; however, QI is integrated into day-to-day operations. "Primary care is probably our most mature, established product line and we have spent a long time trying to do that one thing the best we can. Lots of improvements and standardization have taken place." Examples of other local improvement initiatives include the Care Coordination Home Telehealth program and the Stop Workforce Accidents Team (SWAT) (see Appendix F). "Over the years we have moved up in the VISN Christmas tree so that we are in the middle and achieve over 80%," reported WRJ VAMC's quality manager. "The difference between a number-one VISN and number eight may be miniscule, but in the eyes of the VHA, if you are number one [in the performance measures], you are number one," said De Gasta. "Would I like us to be number one in those measures? Yes, but I am not going to give up doing [other] things that I believe we need to do in order to accomplish that." The role of WRJ VAMC's leadership is to balance the needs and priorities of the whole organization. Batalden endorsed De Gasta's approach: "Gary has this right; he preserves the space to work on improvement." Support, attention and time for improvement work are critical. As the union local president pointed out, "You need to be actively involved in a QI process. You can be mandated to collect measures but what will you do with them when you have them?" "We've had challenges with our performance measures," De Gasta remarked. "We are much more expansive here than just the national quality measures. If you look at the quality measures we're not the star there." "Depends which quarter!" the quality manager countered, suggesting that results need to be looked at over time as opposed to one reporting period when judging performance. WRJ VAMC's chief of staff commented that it is hard to argue with the clinical measures, given the good intentions with regard to outcomes. He explained, "For me the issue with the performance measures is sometimes how the results are interpreted, because of the confidence intervals and the sample sizes. For example, the smoking cessation counselling [measure] can be based on six or eight of 27,000 patients." However, increased data pulls are being considered for 2008 and "there are lots of ways to mine the e-records to look at whole panels of patients by provider and their entire course of care, so you don't have to worry so much about sample sizes or confidence intervals." "We were perceived as close to the worst, now we are perceived as close to the best, and neither is completely true because of difficulties with measurement," cautioned a WRJ VAMC clinician researcher concerned about the dangers inherent in making global judgments of care based on just a few measures. When the VISN focuses on certain measures, there is a strong emphasis on improving those measures, but at what cost? Attention is distracted from elsewhere. "What is the unit of analysis? That is the heart of the issue," the clinician remarked. On this view, there is a bit of a danger in moving to outcomes measures because it has the potential to create perverse incentives. For example, he noted, it is important to focus on how well blood pressure is being controlled in the severely diabetic population, which can be hard to manage. But the easiest way to improve the diabetic measures is to diagnose more diabetics so that fewer sick patients are included in the population. It can also be difficult to create good measures for certain diagnoses, such as psychiatric patient populations, where measures of functional status and an emphasis on recovery models would be needed. Developing information that is "good enough" to guide the organization is still a critical issue for the VA.
"You can't do what we do without electronic medical records," observed the chief of staff. WRJ VAMC clinicians participated in a state-wide diabetic collaborative and it took only 10 minutes to identify all their diabetic patients, compared to other organizations for which the process has posed a major challenge. The e-records form an extensive database that can be mined for clinical comparisons. "We are a bit unusual here; we give out comparative information on a provider-specific basis to all physicians, with their names on," said the chief of staff, something that is not done uniformly across the VA or even across VISN 1. This includes detailed information about how physicians are doing on key measures such as HgA1c or lipid levels for their panels of patients. As one clinician remarked, "I like that kind of feedback ... it's a real quantum leap." Electronic medical records can also be adapted to improve care processes. For example, based on an idea from a national primary care consultant, the chief of staff plans to add a low density lipoprotein (LDL) algorithm with a list of steps and drugs and "one click to the doses." This innovation will encourage staff members to consider multi-therapy for such patients. The system supports WRJ VAMC's extensive use of clinical reminders and, while there is "some reminder fatigue," the chief of staff said, a review showed that they were all important, "so we kept them all." Clinicians spoke favourably about WRJ VAMC's e-health record system: "It makes a big difference. ... It was such an incredible shift for me to be able to see all the meds a patient is on." WRJ VAMC and Dartmouth Medical School: "A symbiotic relationship"
WRJ VAMC has ongoing affiliations with 25 to 35 academic organizations, although it can be argued that the influence of contacts with Dartmouth Medical School have been the most significant. The centre has benefited greatly from its relationships with members of Batalden's Healthcare Improvement Leadership Development group, several of whom are based at WRJ VAMC. "We have a symbiotic relationship with Dartmouth Medical School. They need us because we are their primary clinical site," De Gasta said. WRJ VAMC can focus more on teaching than is possible at Dartmouth Hitchcock Medical Center (DHMC) because the clinical productivity pressures may not be as great. (DHMC is the other major teaching hospital associated with Dartmouth Medical School.) A large number of WRJ VAMC medical staff members teach at Dartmouth. Although it is a relatively small organization, WRJ VAMC hosts a number of national research initiatives. "We have to be innovative and creative," notes De Gasta. "That's why we have that group [of research and national centres leaders] - and it's like herding cats!" Researchers involved in the organization provide benefits because they are, in De Gasta's words, "questioners who throw bombs at the status quo." The research programs, which include the VA Outcomes Group Research Enhancement Award Program, the National Center for Post-Traumatic Stress Disorder and the field office of the VA's National Center for Patient Safety, have $6.0 million annual funding from the VA and the National Institutes of Health. Clinical researchers based at the centre described the VA as a supportive place for clinicians who want to do research and for researchers who want to keep their hand in clinical work. Sponsored by the Office of Academic Affiliations, Department of Veterans Affairs (VA), the VA National Quality Scholars Fellowship Program (NQSFP) is a two-year post-residency QI training program developed and run by Dartmouth's Institute for Health Policy and Clinical Practice. Two fellows at each of six sites across the US are linked electronically for academic and research efforts. Based at one of the six sites, fellows work with senior quality scholars (program directors) and faculty at their site and with the Institute's faculty leaders. The curriculum includes QI theory and research methods as well as completion and publication of clinical QI projects (Dartmouth College 2002b). WRJ VAMC is the program's lead site. The centre's advanced clinic access in mental health is an example of an idea that began as a quality scholar's project and evolved into an award-winning redesign. By embracing an open-access approach and revamping its processes for patient referral, intake and assessment, the WRJ VAMC's mental health clinic has achieved impressive results. While clinic volumes have increased, the wait times to see a mental health specialist have dropped from 33 days to 16.9 minutes, and there are no longer any no-shows. The clinic, which opened in 2004, is located in a primary care clinic; primary care providers are thereby able to bring patients directly to the mental health clinic, with no bookings required. A clerk registers patients and they complete four assessment instruments using touch pads. The data are reviewed by a psychiatrist, the patients are screened to see if any basic tests have been missed (e.g., thyroid) and they have psycho-social interviews with therapists. Upon a patient's first visit, a treatment plan is initiated and, if necessary, a referral is made to the in-patient service. This collaborative care clinic design is known nationwide as the "White River Model." It has won awards from the VA and the American Psychiatric Association. WRJ VAMC is a field site for the VA's highly regarded National Center for Patient Safety (NCPS), based in Ann Arbor, Michigan (US Department of Veterans Affairs 2007g). Root causes analysis (RCA) reports from all VHA facilities are forwarded to the NCPS database and are analyzed by a WRJ VAMC physician researcher who heads up the field office and his/her team. The team looks for trends and system vulnerabilities so that action can be taken to mitigate risks. Team members prepare reports and publish their research nationally. Analyses have identified events that are rare on an institution-specific basis, yet show a pattern when aggregated in the database. For example, a series of near misses with pacemakers was identified across the US; patients were thereupon able to return to have the problem corrected. RCAs are time-consuming to perform, report and analyze, and there has been variation in reporting across the VHA. Because RCAs are valuable for learning, the VHA has implemented a new rule that each facility must annually do four individual RCAs and four aggregate reviews (e.g., of falls or medication errors). When listening to WRJ VAMC staff talk about their organization, interesting facets of the organizational culture become evident. In general, it appears to possess an informal, positive and collaborative interpersonal style, yet be driven when it comes to improvement and innovation. "The director is 'Gary'; his first name is known and used by everyone. We are very laid-back here. ... The director is very engaged and interested in what the front line are doing," said the service line director. As an example of this, De Gasta has borrowed an approach from the Marriott corporation, making appointments with randomly selected front-line staff to spend time getting to know what's happening with them. In addition, the entire executive staff has adopted an open-door policy. At the same time, the billings manager commented that "WRJ has a type-A personality; lots of innovation going on." Systematizing improvement and innovation required an attitudinal shift. "Paul Batalden asked us 'what did you have to unlearn to do Baldrige?' We had to stop being victims. Stop finding excuses," De Gasta remarked. As a humorous reminder, leaders imposed a requirement on themselves to pay a dollar penalty for negative comments: "You have to put a dollar in the pot [at meetings] if you make excuses about not meeting the measures!" De Gasta noted. The chief of staff, meanwhile, said, "I think it is important to break down your processes and understand the parts, but focusing only on negatives makes you think that you are doing really poorly. I tend to an appreciative inquiry approach." He explained how they do medical student reviews, discussing those who are doing poorly first, but ending with those who are doing really well. "I use it more informally; it's more of a psychology of trying to be more positive." When asked whether the improvement focus would survive the impending turnover in senior leadership positions, a service line director responded, "Try and beat it out of us, good luck! It's part of who we are here ... so embedded in what we do." "Quality improvement is pervasive around here; it's our culture," affirmed the chief of staff. "We have a collaborative approach here, get the right people involved," but "it has been years of cycles of refinement to get to this point," observed a service line director. Collaboration includes the unions: "The unions are involved in everything," noted the union local president, a WRJ VAMC staff member who is a trained Carey Award examiner. He does presentations about the importance of union involvement in QI. "If you look at a sample of award-winning organizations, you would see that a key to success is strong labour-management relations," he continued. There are now measurable results included in the performance review process for staff, which creates a connection between the system's QI processes and the front-line staff. One of the challenges is to show front-line staff that the little process improvement project that they are doing contributes to the bigger picture. It may be partly a language issue; it's really an education process. The way we get staff engaged is to get them to understand that they can make changes at the lowest level and see results, to be able to see that immediate improvement. When staff say they have no time to participate I say you are already doing it, but not in a systematic way or documenting it, so you're not getting credit. "You need to show staff that showcase of awards in the hall," said the union local president. Doing so, he claimed, symbolizes the cumulative accomplishment of all the front-line improvement efforts. Building improvement capacity requires ongoing education and skills training. VHA employees have extensive training and leadership development opportunities. Employee and leadership development is crucial for succession planning, because 60% of all managers are eligible to retire by 2008 and 70% of dental staff by 2009 (VISN 1 education services director). These national expectations are used to frame all training efforts, which also include mandatory training in organizational ethics, cyber security and information security in research. 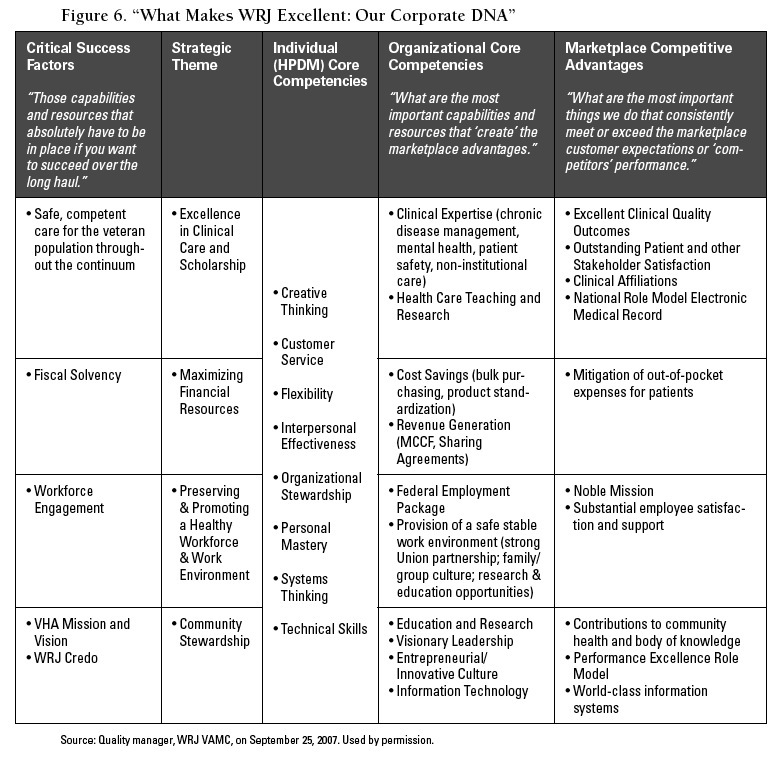 WRJ VAMC has developed a diagram and explanatory table (see Figure 6) documenting its "corporate DNA" to show staff members how the individual core competencies relate to organizational competencies. Although there are national QI education programs available (e.g., Quality 101 and a coaches college), as well as network- and facility-specific training opportunities, improvement training is not standardized across the facilities. VISN 1 network director Chirico-Post cautioned, "You have to be careful about the ice cream flavour of the month." VISN 1's quality management officer added, "We impart the concepts of Lean and Six Sigma, but without the language. All service line directors and many managers have had advanced clinic access training based on IHI's program. The network's education services department has given facilitator training for years, with some overlap between facilitation and improvement tools. WRJ VAMC leaders have emphasized the importance of continuing education and training to support improvement efforts within their strategic frameworks. According to one service line director, "Senior leaders saw value in training as a Carey examiner, to learn about the Baldrige criteria and process improvement. Now that lots of leadership positions are trained we are starting with the staff." Within the centre, the Future Emerging Leaders (FUEL) program curriculum also includes the Carey/Baldrige criteria and process improvement. VISN 1 has made significant efforts to standardize care processes and performance measurement in order to become a high-performing system. Enabled by the VHA's electronic health records system, the network has implemented numerous CPGs backed by electronic reminders. Processes are monitored through rigorous review of performance measures in quarterly scorecards and reports. Teams from the facilities participating in numerous improvement collaboratives have made gains in patients' access to care, patient safety and preventive measures in primary care. Being part of an immense government bureaucracy entails balancing central "rules" with local autonomy. VISN 1's annual budget is $1.5 billion, yet the network director is accountable to a national-level administrator for $1,000 allocated for training for four new positions. Relationships with various levels of elected members of government also must be managed. "Congress really are friends of the vets and want to do what's best for them," Chirico-Post noted. As a local example, in this highly politicized environment congressional members (as well as New Hampshire's governor) are considered to be WRJ VAMC stakeholders, and that organization's senior leaders conduct quarterly briefing meetings with them to discuss issues facing the medical centre. Equipment and program placement can be deeply political decisions because congressional members favour local facilities in the areas that they represent. Budget appropriations can also be affected by issues that reach the national press. The highly publicized problems at the army's Walter Reed Army Medical Center, for example, have brought money from Congress for infrastructural improvements. In contrast to hiring freezes and deficits with which the medical centres have had to deal, they are now faced with having to decide quickly how to spend the unexpected funds, but with restrictions on how the money may be used. With changes in national policy decisions, benefits entitlement and coverage of particular veteran groups have often tended to transform over the years. These shifts have had consequences for VISN 1's planning and care delivery. For example, since entitlement to drug benefits was opened to all veterans, many patients have opted to get their medications from the VHA system; these same people, however, also seek care outside the system. Approximately 40% of VHA patients are co-managed with private sector providers, from whom they may receive various high-tech procedures. This situation can create safety issues related to medication monitoring and adjustment, for example, when veterans get their post-transplant drugs from the VHA yet their transplant care is delivered elsewhere. "What is critical to acknowledge is that we operate in a political environment; we have to sing the political song," says De Gasta. An advantage of being part of the network is that while the VISN 1 is accountable for local medical centres' performance, it also recognizes the unique identities of each. The network acts as a buffer between the national level and the local organizations, allowing some latitude for local initiatives and innovation. While all VA medical centres are accountable for their performance on common measures, WRJ VAMC's smaller size and location may also make it easier for it to be something of a maverick. "White River Junction is little enough that they can permit more flexibility compared to larger centres; to let White River Junction run on a longer leash is less risky," Batalden suggested.1 De Gasta also described his role as a senior leader as being, in part, to protect staff members and help them make sense of national initiatives and changes. Indicative of the frequency of changes his organization confronts, De Gasta commented, "I have a magnetic organization chart board so it can be changed each week instead of paying $400 each time to reprint it when the government changes things!" Standardization and performance measurement - improvement or compliance? Across VISN 1 there has been strong emphasis on standardization - of equipment, processes and procedures. However, Chirico-Post noted that this is also a continuing challenge: "How to get what is left in those facilities to a standardized approach?" She also mused about the limitations of performance measurement and the difficulty of knowing how well the network's eight facilities execute care. Because the spinal cord program is so focused, there is relatively good information about how well it is performing; however, in some other service lines (e.g., geriatrics) the measures are not so clear. Despite the emphasis on uniform performance measurement and standardization both nationally and within VISN 1, there are still variations in processes, structures and cultures across its constituent organizations. "If you've seen one network, you've seen one network," Chirico-Post noted. The strong pressure to meet performance measure targets can stimulate compliance lectures as well as improvement activities. Several VISN 1 staff members commented that preoccupation with the focused set of measures can distract attention from other important issues. A number also said that it can be difficult to keep up with the moving targets. VISN 1 and its medical centres face numerous pressures in a changing landscape. Between 2007 and 2013, the number of veterans over age 85 in VISN 1 is projected to increase by 47%, while the overall number of veterans in New England is projected to decrease by 42% by 2023 (VA New England Healthcare System 2006c). An aging population requires more intensive and costly services, which increase pressure on the system. WRJ VAMC also faces resource challenges; for example, transportation issues are harder to resolve because it is a rural centre. De Gasta asserted, "The Kizer model assumed there would be cost savings in the shift from acute to primary care, but the resources are not there. We still have to deliver specialty and acute care and we are seeing twice as many patients now." At the same time, the declining population of veterans has prompted discussions about the very future of the VHA system. VISN 1's organizations have benefited from stability and long tenure of leadership positions; however, a number of staff members are eligible to retire in the short term. Succession planning and ensuring that new leaders are developing in the ranks have been intensifying as network priorities. WRJ VAMC's chief of staff noted, for instance, "Normally we've had very little turnover, but people with long institutional memory are retiring." While recruitment may be challenging, WRJ VAMC has been successful in certain areas; for instance, in attracting primary care physicians. The turnover of leaders and staff will test both VISN 1 generally and WRJ VAMC in particular (Chirico-Post retired in March 2008 and De Gasta retired at the end of 2007). Has the network's improvement culture permeated its organizations or will the long institutional memory leave with key individuals? In little more than a decade, the VHA has been transformed from an organization under fire for deficiencies in the quality and safety of its care to a high-performing organization that has demonstrated better outcomes than those delivered in non-VA facilities. These achievements commenced with policy initiatives that shifted the VA away from its focus on in-patient care in largely independent facilities with limited accountability for results. The new VA became a results-focused system that has made access to care a priority and that has integrated services across the continuum. The challenges to maintaining improvement in this highly complex service delivery system will require continued strong leadership. ACS - ECG in 10 min of arrival or 15 min prior. ACS - Reperfusion - PCI in 90 min. ACS - Reperfusion Thrombolytic Rx in 30 min. Source: VISN 1 headquarters staff on September 11, 2007. Used by permission. The mission of the Office of Quality and Performance (OQP) is to support clinicians, managers and employees in providing the highest quality of care for veterans. To improve care by reducing variation in practice and systematizing "best practices"
Source: US Department of Veterans Affairs (2007a). Used by permission. Source: Document provided by associate director of nursing, VA Boston Healthcare System, on September 10, 2007. Used by permission. In 2005 WRJ VAMC began a home telehealth monitoring program for heart failure patients who used text messaging to communicate daily with specialized care coordinators. The program now uses a mix of technology - including videophones and "health buddies" (a device programmed with a condition-specific dialogue that prompts patients to enter data) - to allow patients to send in clinical information and status updates. Care coordinators review the updates, discuss care issues with the patients and consult with other providers as needed. About 100 patients participate in the program, including patients with diabetes, hepatitis C, hypertension and spinal cord injuries, as well as those in palliative care. A six-month pre- and post-implementation program review showed that ED visits and in-patient admissions were 25% and 35% lower for this population and that 30-day readmission rates had dropped by 67% (VA New England Healthcare System 2006b). In addition to clinical improvements, WRJ VAMC is participating in a national VHA initiative to develop minimal-manual lift environments to avoid injuries to staff members and patients. An interdisciplinary SWAT team has implemented ergonomic technologies and practices, as well as after-action reviews of accidents and near-miss reviews. As a result, in 2006-2007 WRJ VAMC had only one minor injury reported and no workdays lost to injuries experienced while handling patients. "It just snowballed; staff got involved because of positive results" (SWAT team leader). Batalden, P.B. and J.J. Mohr. 1997. "Building Knowledge of Healthcare as a System." Quality Management in Health Care 5(3): 1-12. Jha, A.K., J.B. Perlin, K.W. Kizer and R.A. Dudley. 2003. 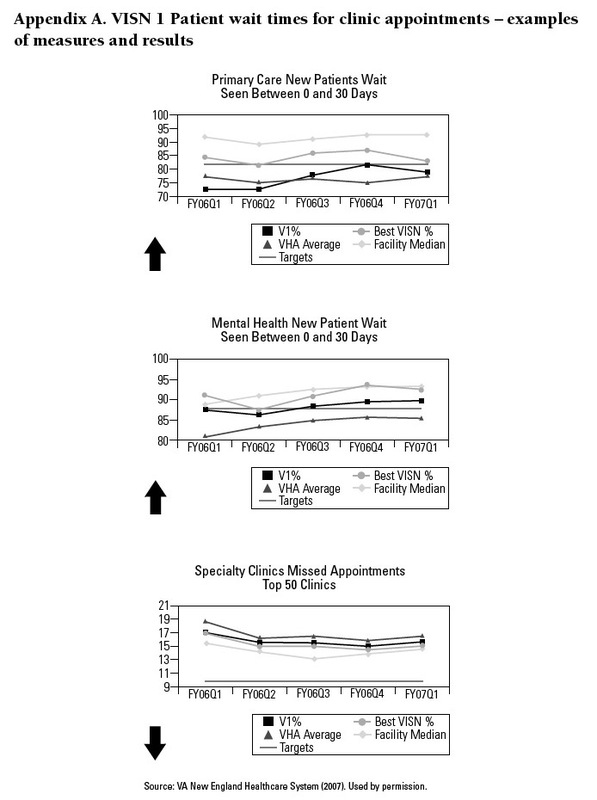 "Effect of Transformation of the Veterans Affairs Health Care System on the Quality of Care." New England Journal of Medicine 348: 2218-2227. Kizer, K.W., J.G. Demakis and J. R. Feussner. 2000. "Reinventing VA Health Care: Systematizing Quality Improvement and Quality Innovation." Medical Care 38(6): I7-I16. VA New England Healthcare System. 2006a. Annual Report 2006. Bedford, MA: Author. Document provided by VISN 1 headquarters staff on September 11, 2007. VA New England Healthcare System. 2006b. Care Coordination Home Telehealth Program: Performance Improvement Utilization Report Presented August 2006, OCC Conditions of Participation Review. Bedford, MA: Author. PowerPoint slides provided by program manager on September 12, 2007. VA New England Healthcare System. 2006c. Stage 2: Strategic Plan for FY 2006-2010. Bedford, MA: Author. Document provided by VISN 1 headquarters staff on September 11, 2007. VA New England Healthcare System. 2007. The Secretary's Robert W. Carey Performance Excellence Awards. 2007 Application. Bedford, MA: Author. Document provided by VISN 1 headquarters staff on September 11, 2007. 1 After reviewing the case study, VHA officials noted that, while each facility has a unique identity, all its centres are accountable and all must comply with required rules, regulations, directives, guidance and standardization.